The year was 1963. Cost for a week’s food for a family of four was $25, gas was sold at 35 cents a gallon and the average price of a typical Ottawa home was $16,549. But money was becoming increasingly harder to come by. Mired in an economic recession, which had resulted in the devaluation of the Canadian dollar, massive unemployment and the subsequent replacement of John Diefenbaker Federal Conservatives with the Lester B. Pearson Liberals, an Ontario task force had begun to delve into housing conditions in the province. Headed up by Ken Soble, owner of CHCH-TV in Hamilton, that task force was the most blatant example of a growing movement to decentralize delivery of housing programs across the country. The Federal Central Mortgage and Housing Corporation was no longer going to be the lone decision maker, and builders were now recognizing that a strong national builders association was not enough. A group representing 10 of Ontario’s local associations met with representatives from the national body in Kitchener at the now-defunct Evergreen’s Motel, where they elected Eric Johnson to serve as their first chairman, with the Canadian association agreeing to provide support staff. The first item of business was to name representatives to the Soble task force, although the greater purpose was to give residential builders a voice in the provincial government, facilitate changes in the industry and provide networking opportunities for home-building businesses, suppliers and services. While OHBA was less prominent in the beginning, operating in the shadows of both the national body and the Toronto Home Builders’ Association, early OHBA presidents gradually helped grow membership and awareness. By 1972, the time had come for the association’s first independent annual conference, which returned to the Evergreen’s Motel in Kitchener that fall. The city had just launched its now annual Oktoberfest celebrations, which helped attract delegates to the conference. OHBA’s annual conference was held in Kitchener again in 1973 and ’74, before moving to the newly completed Harbour Castle Hilton in Toronto in 1975. 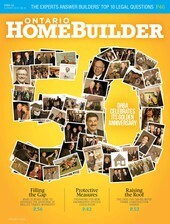 Since the founding of the Ontario Home Builders’ Association 50 years ago, 46 men have held the presidential post, each navigating a unique course of impediments in helping shape the future of both their association and the province’s ever-evolving home building industry. 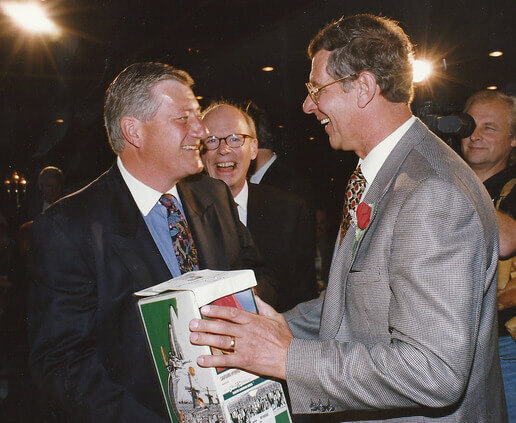 Nine former presidents (and OHBA’s current leader) share their most indelible memories below. “The challenges during my presidency were not that different than they are today—fighting rising land, development and service charges. I remember when I built my first homes around 1957. I bought five lots and paid $500 per lot—serviced—and sold the houses for $10,900. The land cost was 5% of the house. Today our land costs are closer to 40%. “I became OHBA president because I wanted to contribute more to our industry and felt OHBA had to be boosted so that it carried more weight. It helped that I was also president of Monarch as people knew its reputation and were eager to join the flag. “During my term we were promoting ourselves as the engine of the economy—the impact we made and the jobs we created. It was kind of an awakening of the persona of the Ontario Home Builders’ Association. I also made it part of my mandate to get around and visit as many of the local associations as possible. It was a time when the industry was really growing, and there were challenges because of that growth, particularly the warranty program. There wasn’t enough labour available and things were getting rushed. But much better consumer protection came as a result. “Some of the biggest issues I faced during my presidency were members building unregistered homes. The problems with Queen’s Park were probably not any easier than they are today, but I think our relationships with the Ministers were more hands-on. I remember Housing Minister Chaviva Hosek giving a luncheon speech where she brought out a hammer saying she had heard Heron had been hammering her at the opening breakfast. However, one of the biggest issues was internal, where Toronto would attempt to take the lead on a problem and make presentations to Queen’s Park—such a waste of time, as the politicians outside of Toronto would never be onside. This problem disappeared when David Horton and Stephen Dupuis came onto the scene. They both understood the strengths of both associations. If the industry speaks at Queen’s Park the lead would come from OHBA, with strong support from Toronto and the rest of the province. “My path to becoming OHBA president began when Frank Giannone, asked me to be BILD’s representative on the OHBA board. In an effort to get a running start, I met the late David Horton for lunch to get the lowdown on the current issues and the board politics. After my first board meeting I was pulled aside by the president, Alido DiIorio and was offered the position of 2nd vice. An opening arose due to someone moving forward, and based on my credentials and the lunch with David they offered me the position. I was in the right place at the right time! “I got involved in the Brantford Home Builders’ Association and began taking an interest in the industry affairs in early 1980s. I took great interest in advocating not only for my own company’s interests but the overall construction and home builder industry in terms of legislation. The departing Liberal government had brought in lot levies, which we now know as development charges. We fought the provincial government in court and won the first round and staved them off for two years. We knew it wasn’t a permanent situation, but we accomplished our goal. “I was first president of the London Home Builders’ Association in 1995/96. During this time I was also a member of the OHBA Membership Committee and I thought the OHBA could use a leader like me who was set in his ways. The late Mr. Horton, who taught me a lot, was a great supporter. On many occasions when I had a strong opinion about a subject, he told me to sleep on it for a night and see if I still felt the same the next day. He was usually correct. He was pleased he could still teach a stubborn Dutchman some new tricks! During my term, there were many issues, but some of the most pressing were municipal red tape, mandatory sprinklers, builder education and illegal building. On the horizon was the harmonization of Ontario retail sales taxes and federal GST. By the time it arrived, Frank Giannone was carrying the can, but OHBA was well prepared to address its negative impacts on our industry. “As far as joining the OHBA board goes, OHBA President James Bazely (2009-2010) did the dirty work of twisting my arm, but I think David Horton was the puppet master, and I say that with great affection. I am very proud to have been the last OHBA president that David encouraged to serve. As it was a transitional year, there were many key issues that we had to deal with: Joe Vaccaro succeeding David Horton; the sudden loss of BILD President and CEO Stephen Dupuis; the Humanitarian Build, an Ontario Building Code cycle; managing the SB-12 implementation; and the ongoing work on the transformation of CHBA. Working with staff, the executive and the board on a variety of initiatives kept me very busy, but a highlight was the introduction of the Builder Education program that was ultimately launched under Leith Moore’s presidency. Initiating the ‘Locals First’ program and visiting over 20 locals over the past two years has been a significant contribution to ensure we hear the voice of our members. I am really proud of that. “As I was completing my term as the BILD Chair I was asked by Bob Finnigan to serve on the OHBA executive. Working with the OHBA Executive and Board, you can really see the passion of our industry across Ontario. When Joe Vaccaro succeeded David Horton at OHBA, we had a conversation about the next evolution of OHBA and that, combined with knowing the executive team and board, is all it took to get me to commit to serve as OHBA President. Obviously OHBA was in transition. With David retiring and passing, and Stephen’s unexpected passing at BILD, they found themselves in transition, so the key organizational issue was to keep things moving forward and building from the work Past President Doug Tarry had started with the ‘Locals First’ initiative. Building from that, we had a provincial election with a minority government, the retiring of the Premier, the party election of a new Premier and a new set of Ministers. All this transition and uncertainly really forced us to work on improving our communications to our local HBAs and our members so that they didn’t feel disconnected from everything that was happening.